Intense heat that causes some areas of the eye´s drain to shrink, resulting in adjacent areas stretching open and permitting the fluid to drain more easily. When medication does not control the pressures in the eye. Glaucoma is the diagnosis given to a group of ocular conditions that contribute to the loss of retinal nerve fibers with a corresponding loss of vision. Glaucoma therefore is a disease of the optic nerve, the nerve bundle which carries images from the eyes retina to the brain. The eyeball is basically a rigid sphere filled with fluid. As the total amount of fluid within the eye increases, so does the pressure, similar to over inflating a tire. Many people know that glaucoma has something to do with increased pressure inside the eye. The higher the pressure inside the eye, the greater the chance of damage to the optic nerve. Glaucoma is said to be one of the leading causes of blindness in people over the age of 40. It affects approximately 2% of that population. Loss of peripheral (vision off to the side) is the earliest symptom. Left untreated the field of vision will continue to narrow leading to tunnel vision. If detected early, loss of vision can most often be prevented. The front portion of the eye is filled with a nourishing, protective fluid called aqueous humor. This transparent fluid is continuously circulated through the inner eye, flowing in and draining out, much like a sink with the faucet turned on all of the time. If the "drainpipe" gets clogged, water collects in the sink and pressure builds up. If the drainage area of the eye called the Trabecular Meshwork is blocked, the fluid pressure within the inner eye may increase, resulting is decreased blood supply to the eye's optic nerve and damage. The optic nerve will no longer be able to transfer the information form the retina to the brain. This damage can result in partial or complete blindness. High pressure alone does not mean that you have glaucoma. Your eye care provider puts together many kinds of information to determine your risk for developing this disease. The most important risk factors include: Age, near-sightedness, African ancestry, a family history of glaucoma, past injuries to the eyes; a history of severe anemia or shock. 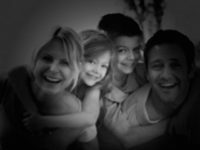 Your eye care provider will weight all of these factors before deciding whether you need treatment for glaucoma, or whether you should be monitored closely as a glaucoma suspect. This means your risk of developing glaucoma is higher than normal, and you need to have regular examinations to detect the early signs of damage to the optic nerve. 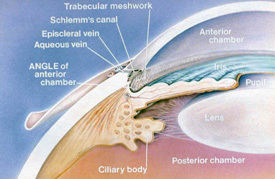 As a rule, damage caused by glaucoma cannot be reversed. Therefore, the goal in the management of glaucoma is to reduce the intraocular pressure to the point whereby the remaining healthy nerve fibers are able to receive proper nourishment and therefore maintain function. Treatment for glaucoma requires a "team" made up of both you and your doctor. Your eye doctor can prescribe treatment for glaucoma, but only you can make sure you take your eye drops so never stop taking or change your medications without first consulting your eye care provider.